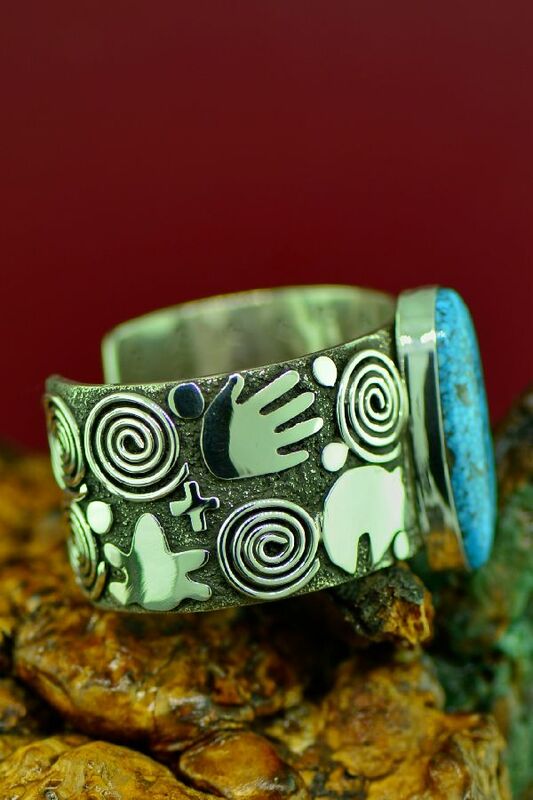 This incredible bracelet is designed and handmade by award winning artist Alex Sanchez, Zuni/Navajo. 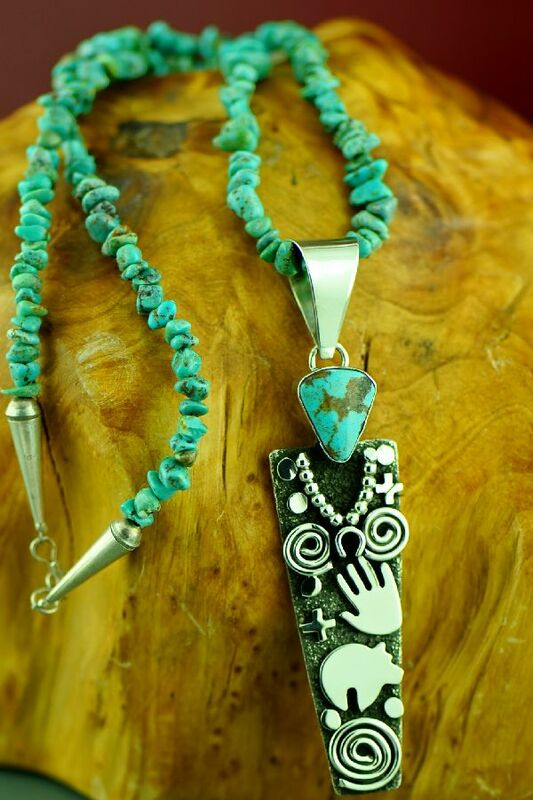 This piece comes from his Petroglyph collection. Each piece is one-of-a-kind. 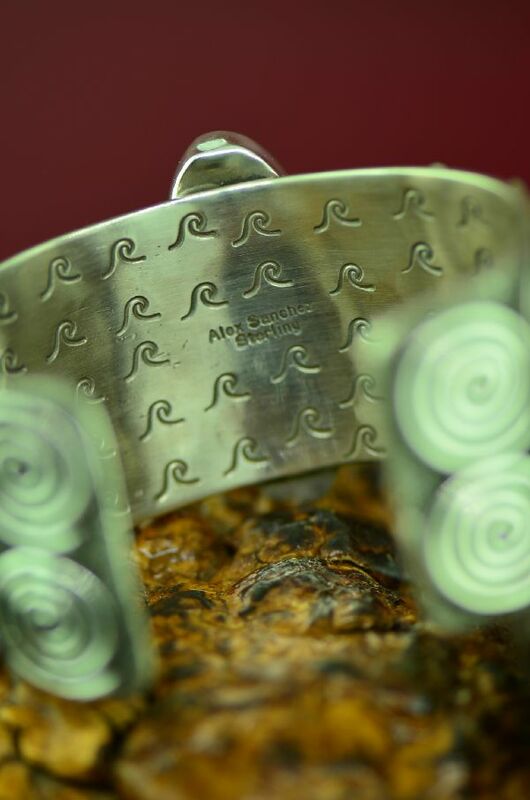 Alex uses heavy gauge silver to create his pieces of art. 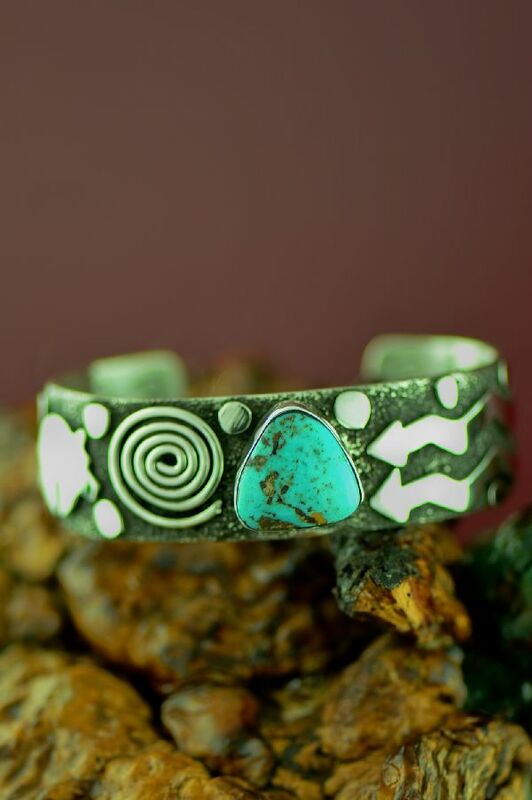 Alex has chosen a beautiful Kingman Turquoise stone to create this bracelet. 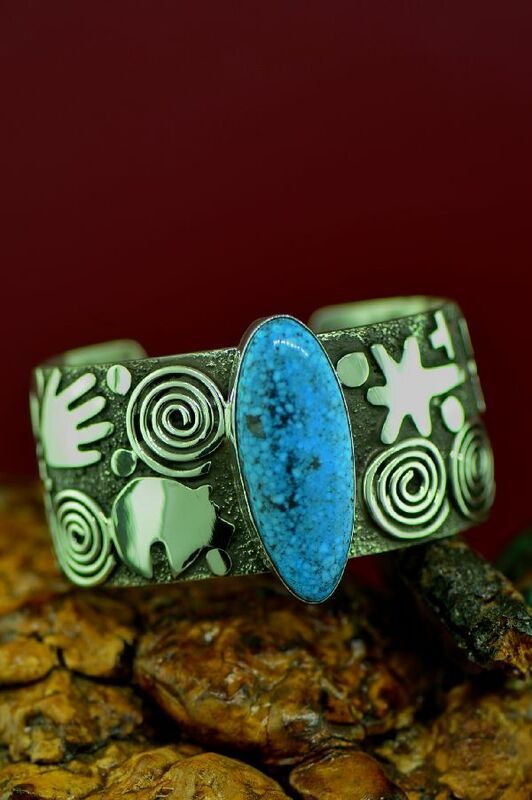 The Kingman Turquoise stone measures 1-3/4” tall by 3/4” wide and is set in a smooth bezel surrounded by phenomenal silver work. 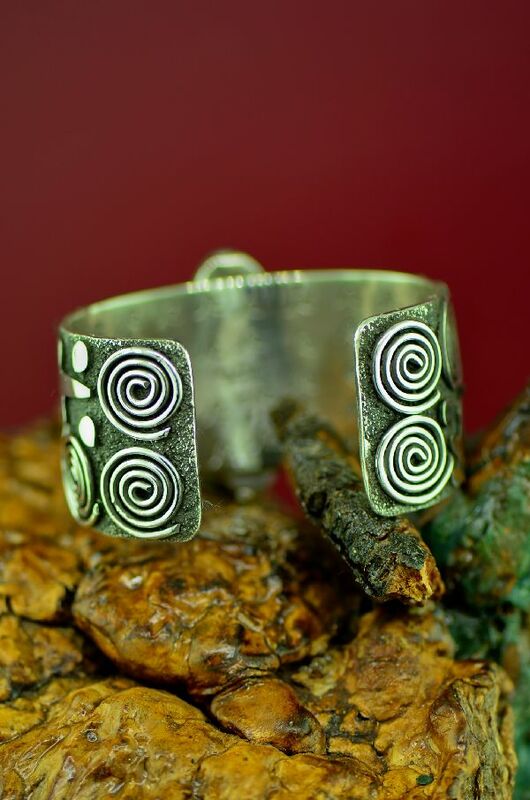 The design in this wonderful bracelet depicts a Bear, a Petroglyph Man, 2 dragonflies, 10 Spirals, 2 - Four Direction Symbols, a Healing Hand and 9 Rain Drops. The bear is believed to bring strength, introspection, spiritual journey through life. The Petroglyph Man represents the provider. The Dragonflies symbolize beauty and the Spirals symbolize migration and long life. The hand symbolizes healing and the rain drops symbolize renewal. The beauty of this bracelet does not stop on the outside of this bracelet. It is also hidden on the inside, where the casual observer wouldn't see it. The artist has hand stamped 88 water symbols. 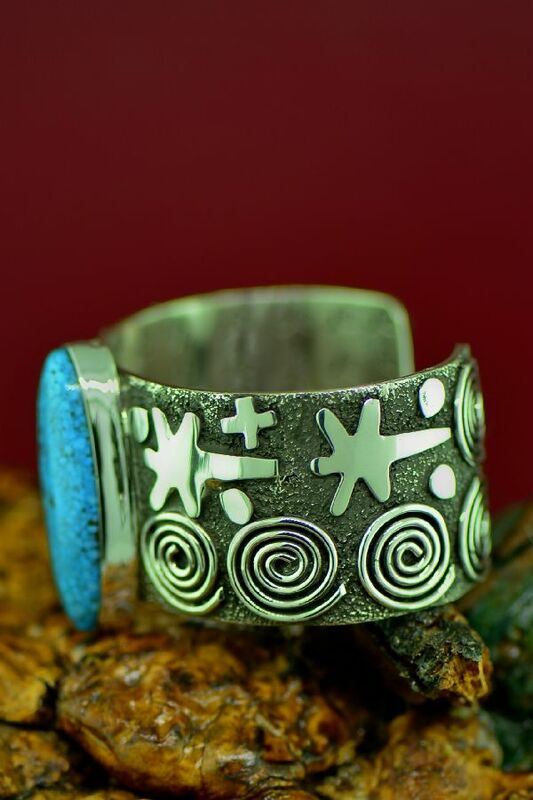 This incredible bracelet is 1-3/4” wide and will fit a 5-3/4” to 6-1/4” wrist. It has a 1-1/8” opening. This bracelet is substantial in weight; it weighs 3.9 ounces or 110.78 grams.